Her singing causes the windows to shatter. The viral infection caused his death. Heavy exercises cause sweating, thirst, and fatigue. It seems reasonable to think that general causation is to be analysed in terms of singular causation. So "type X events cause type Y events" might be understood as something roughly like "particular events of type X are highly likely to cause particular events of type Y." An event X is causally necessary for an event Y if and only if Y would not have happened if X had not occurred. An event X is causally sufficient for an event Y if and only if the presence of X alone is enough to bring about Y. So for example, heating a gas is causally sufficient but not necessary to increase its pressure - you can increase its pressure by compressing the gas as well. Pressing the light switch might be causally necessary to turn the light on but it is not sufficient since electricity is lso required. Sometimes, a causal factor can be salient or relevant to the effect even if it is neither necessary nor sufficient, e.g. hardwork might be a causally relevant factor that is part of the explanation of why a student has passed, but presumably it is neither necessary nor sufficient. We can also draw a distinction between triggering and standing or structural causes. A triggering cause is a cause that sets into motion the chain of events that lead to an effect. Whereas a standing cause is some static condition that contributes to the effect only in conjunction with a triggering cause. For example, suppose there was an explosion in a room full of flammable gases. The triggering cause might be the event of someone lighting a match in the room, and the presence of the gases would be the standing cause. Similarly, the standing cause of a particular riot might have to do with high unemployment, with the triggering cause being some particular event such as perhaps someone being beaten up by the police. The universe contains objects and processes at various levels. Bigger objects such as galaxies are made up of stars and planets, and societies are composed of smaller things such as individual human beings. Similarly, high level processes such as the conduction of electricity is composed of lower-level processes such as the movement of electrons. 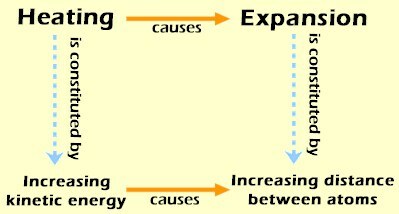 To explain causation, it is not enough just to know that A is the cause of B, we need a theory that explains how A causes B. What is needed is a theory of the lower-level causal mechanisms that lead from A to B. What this diagram shows is that a high level physical causal process is explained in terms of lower-level mechanisms. Without lower-level mechanisms, we would not be able to understand how high-level causation can occur. This applies not just to physics but to other disciplines as well. For example, in macroeconomics, high-level properties like GDP, inflation and unemployment rate are also to be explained at a lower level by the actions of individuals in the economy.